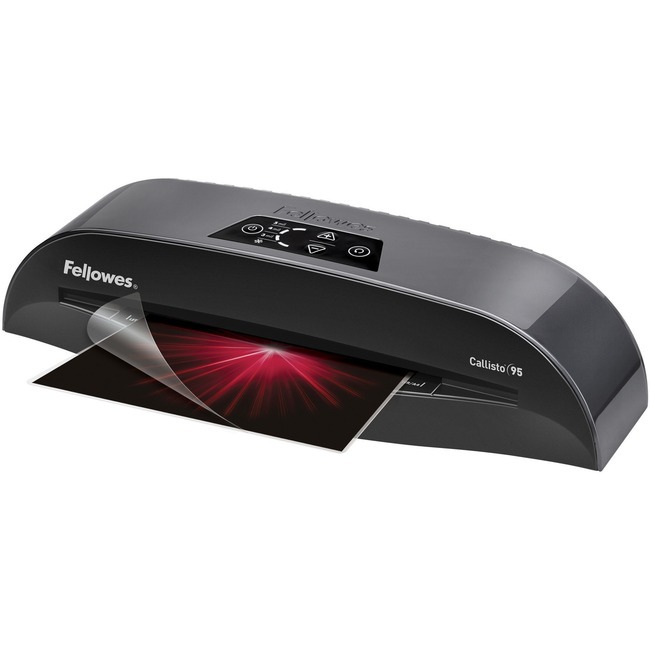 Designed for small office applications, the Callisto 95 Laminator accommodates 9-1/2" wide documents and features HotSwap Technology that allows you to instantly change pouch and document thickness without waiting. Unique HeatGuard Technology keeps heat inside so the laminator is comfortable to touch. Use the three temperature settings for laminating both 3 and 5 mil hot pouches and cold self-adhesive pouches. Laminator is ready for heated lamination in 1 minute and laminates 19" per minute. Reverse mode disengages pouch for re-centering or removal. Auto shutoff prevents overheating when not in use. 9-1/2" entry width accommodates multiple document sizes. Carrying handle allows easy transport. Laminator also includes exit sensor with auto reverse, exit tray, color refresh and a laminating starter kit.